DIY can be perilous when it comes to music, and while it is a fairly common approach nowadays, it is not always one that works extremely well, especially in pop music. But when a DIY record sounds as lush, polished and accomplished as Jherek Bischoff’s Leaf debut, it beggars belief how just one person can be responsible for such a complex and exquisite record. But this is pretty much what Composed is all about. Originally composed on a ukulele, then painstakingly recorded one instrument at a time, Bischoff visiting each of the musicians who form his virtual orchestra to record them in their living rooms, at times layering a number of performances from one player, all this captured on a single microphone, and all on a laptop, to achieve a convincing orchestral sound for the fraction of the price of a real ensemble. The same approach was used to record the vocalists’ performances, and the list of his contributors reaches quite far and wide, from Carla Bozulich (Evangelista), Dawn McCarthy (Faun Fables) or French actress and singer Soko to Caetano Veloso or David Byrne, each taking their place alongside Bischoff and his makeshift orchestra, with Greg Saunier (Deerhoof), Nels Cline (Wilco) also bringing instrumental touches on a couple of pieces. 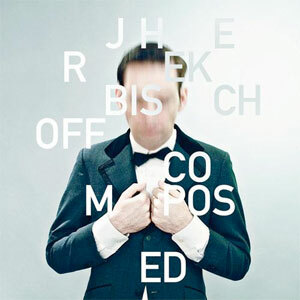 Aged 32, Seattle-based Jherek Bischoff may still be relatively unknown, yet he has been involved in countless projects and formations (Parenthical Girls, The Dead Science, The Wordless Music Orchestra amongst others), never settling for long on any, but at times working on more than one project at a time. It is therefore not surprising that this self-taught intrepid touche-à-tout embarked on such an ambitious venture for his debut solo record. Following a short instrumental intro, David Byrne takes charge of the poetic and suave Eyes, which unfolds like a warm summer day, softly rocking and rolling to the rhythm of a gentle breeze. Later on, it is Bischoff himself who takes on vocal duties and finds himself in a similar disposition on Blossom, a song on which Nels Cline also appears on guitar. The epic pop escapade which is Young And Lovely sees Zac Pennington (Parenthical Girls) and Soko sharing vocal duties on one of the most cheerful moments of this record, but Insomnia, Death And The Sea, fronted by Dawn McCarty is a much more dramatic affair, which is not without recalling Marc Almond’s sombre duet with Nico from The Stars We Are album. At times, Bischoff opts for more stripped down orchestrations, giving Caetano Veloso quite a pastoral piece with The Secret Of The Machines, a song based on a poem by Rudyard Kippling, but keeping sweeping effects to a minimum. Equally Your Ghost sees Craig Wedren negotiate his way through sections of plucked strings before reaching more enveloping orchestral riches, which The Nest, performed by Mirah Zeitlyn, with Paris Hurley on violin, has quite a luxurious folk feel. If Composed definitely owes to pop music, its roots are to be found elsewhere. Cinematic and ambitious, it is infused with elements of classical music tainted with touches of folk, and shows Bischoff as an extraordinarily versatile composer. Despite remaining somewhat in the background throughout the record, he serves his contributors with elegance and distinction, and they return the favour by delivering extremely dignified performances. The result is an incredibly rich and imaginative record which should become the ultimate soundtrack of the summer.